Every “dusty independent agency” dreams of a 7.4 magnitude groundswell of interest in their work. The UK Natural Environment Research Council (NERC) achieved that nearly overnight with their captivating #NameOurShip campaign. The result was tens of thousands of votes, a crashed website, and global news coverage in favor of the runaway favorite: Boaty McBoatFace. 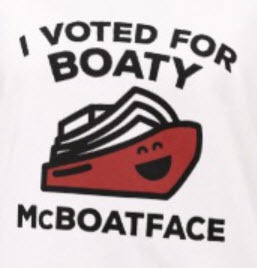 Boaty McBoatFace went down in history as an enormous opportunity wasted. Instead of riding the wave and engaging with hundreds of thousands of new supporters, NERC freaked out and went old school. When they didn’t like the answer they got, they bait-and-switched their public in favor of a safe choice. We want that once-in-a-lifetime opportunity. We want to say that our nonprofits will be able to capitalize upon that magical event when it happens to us. In each of these cases, neither organization was prepared for or able to harness the energy coming their way. Maybe amidst all the noise and confusion of the moment, they weren’t able to recognize that the runaway train had their name on it. Fortunately, New Power (the book) provides ways to help us recognize those moments and capitalize on them. Last week, the HBG Book Club was delighted to host New Power’s co-author Henry Timms to our wrap-up meeting discussing the book. Over the last 6 weeks, we’ve met once a week to discuss two chapters, and all of us were eager to ask lots of questions and discuss the conclusions we’d drawn. Our philanthropy-related questions were met with thoughtful responses and Timms even provided further examples of New and Old Power not mentioned in the book to illustrate his points. Old Power works in ways we are very familiar with: top down organizations where information, control, and license to act are maintained amongst a few. Power is currency. It is familiar and traditional, like many companies on the S&P 500. New Power works in ways that we are just beginning to recognize: distributing control and action to those who want to take and run with it. New Power is like an electrical current – it can energize and activate anyone who wants to grab hold. Think of Flash Mobs, Uber drivers, and participants in the Ice Bucket Challenge for examples. Old Power and New Power are not mutually exclusive in organizations. In fact, it’s desirable that both forms of power exist and co-exist within organizations. Timms and Heimans provide examples of ways that many organizations – including yours – can make the most advantage of each kind. We asked Timms about the process of writing the book and about their research process (“lots of rabbit holes!” he said, laughing, which struck a chord with all of us!). We talked about politics and movements and companies and governments utilizing a combination of Old and New Power to their advantage and detriment. At the 92nd Street Y they’re being intentional about innovation. They’ve created an innovation team among the staff charged with widening participation at scale. There’s an expectation for innovation amongst the board members as well. Timms described to us a capital campaign they shared by virtual reality. As he talked, I imagined donors, staff, the board, members, artists, lecturers, and little kids all strapping on a VR headset to see what ‘their’ new building was going to look like. Onsite or maybe in their own living room, stakeholders were walking through rooms in the air that their current and future donations would make real. That kind of creativity creates ripples of interest outside of constituencies. New Power is innovative, participatory, and small “d” democratic. Its movements and actions can take off by happenstance, or they can have a purposeful origin. It can start even at a small nonprofit with a small budget, because one beautiful thing about catalyzing New Power is that it can be deployed on social media which is free and accessible to many. Whether planned or unplanned, the purposeful nonprofit can be the very happy beneficiary of supported, uncontrolled action (think ALS or NERC) — especially if it’s prepared for what happens after the jolt of current strikes. New Power provides a good framework (with interesting case studies) to learn about what this resource is; how it’s used for good and ill; and how to recognize and utilize it in your organization. Recommended reading. The HBG Book Club would like to thank Henry Timms for joining us for our final discussion of the book, and for supporting and amplifying our conversation about the book on social media.